Occasionally people have a vision, a dream, a fantastically great idea…but they don’t know how to get there, or perhaps even what it means! This little article is for anyone that has ever dreamt of being a mountaineer and has made the first step in finding a course that will help them achieve that goal. The only trouble is there seems to be so much to choose from, what does it all mean? So what is a mountaineer? First off lets look at what a mountaineer is. I think this is relevant to who’s eyes we are looking through. When I was 9 my school friends considered me a mountaineer because I had climbed Snowdon. Your average rock climber might not agree with that definition! I think that a mountaineer is anyone who enjoys pushing their comfort zone and learning new skills in the mountains. For the beginner this could be climbing Snowdon but as your career progresses it could be putting up new routes in Patagonia. Traditionally there has always been an apprenticeship to serve in the mountains and if you want a fully rounded set of skills the same values still hold true today. It is no good being able to climb ice if you do not know how to navigate off the top of the mountain in a winter blizzard. Equally you would not want to go on a grade 3 scramble if you had never been hill walking before – it would scare the pants off you! Hillwalking: I think that hillwalking provides a really sound base for all mountaineering activities. It will teach you to be self sufficient in the mountains, to be able to navigate with a map and compass, carry enough food and provisions for the day, perhaps camp out overnight and be at one with the mountains. Hillwalking will also give you a good base fitness level and help you to acquire some basic movement skills on steep and rough ground. If you have never been out in the mountains before have a look at our range of hill skills and mountain navigation courses. Trekking abroad: Once you are happy with your new found skills in the UK you might want to consider heading out for a summer trekking holiday where all of your skills are put into a much bigger vista surrounded by snow capped peaks and of course exotic food and fine wines! Have a look at our Alpine Trekking holidays. Winter Skills: The natural progression for people who are comfortable in the mountains in summer conditions is to head out in the winter. You will use all of the same skills but in a more demanding environment where you will need to cope with extreme cold, shorter daylight hours and the risk of avalanche. 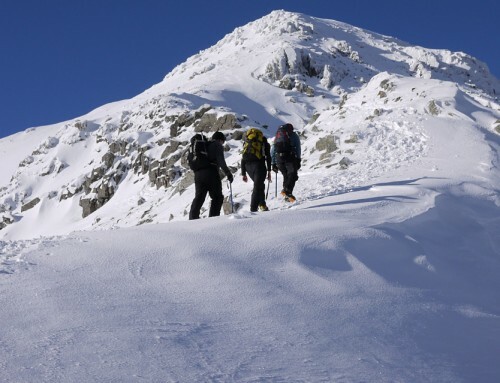 You will also need to learn how to use an ice axe and crampons to cope with movement over snow and ice. We run weekend and 5 day winter skills courses in Scotland from January to March. These are ideal for equipping you with the skills necessary to be a self sufficient hill walker in winter. Scrambling: This is probably the step up that will make you feel like a mountaineer for the first time in summer conditions. Scrambling takes you onto routes that require the use of your hands. They are graded from 1 to 3 with grade 1 being the easiest. Famous grade 1 routes include Crib Goch on Snowdon or Striding Edge on Helvellyn. Our intro to scrambling courses are a great introduction. If you want to start from scratch we run a 5 day course that covers the basics of hillwalking and scrambling over the week. As you get confident you will be able to progress onto grade 2 and 3 scrambles that require the use of a rope to protect a slip or fall. We run an advanced scrambling course in Snowdonia. You may also want to visit the mecca of UK mountaineering, the Isle of Skye and the majestic Cuillin Ridge – the UK’s answer to the Alps. Rock Climbing: Many people, myself included, drift into climbing by accident. I worked through the apprenticeship almost without realising it. I started rock climbing so that I could get up harder mountains and then started to enjoy it in its own right. In no time at all you can become a crag rat! 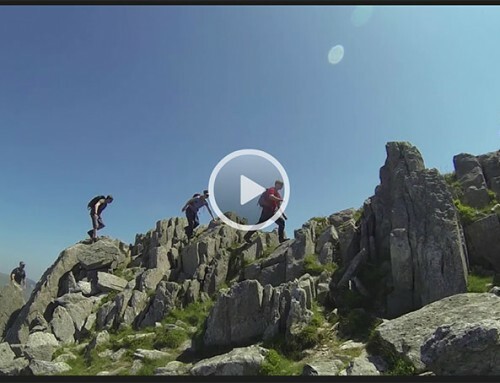 I run a range of climbing courses outside in Snowdonia. If you have never climbed before you may want to consider a local climbing wall to get a feel for it and be introduced to how the basic equipment works. Winter Mountaineering and Snow & Ice Climbing: This is where you put everything you have learnt so far into practice in the hostile environment of the mountains in winter. Winter Routes are graded from 1 (beaing the easiest) through to 10 in the UK. (To give you and idea of how standards are progressing not that long ago 5 used to be as hard as it got!) If you want to progress to Alpine and Himalayan mountaineering then these skills are the ones that you will be using on the bigger routes. The ability to look after yourself in the vertical arena in the snow and ice – awesome! We run a variety of winter climbing and mountaineering courses in Scotland. If you have a specific goal in mind and would like a bespoke package to help you achieve it then look at our private guiding option. We can provide training from 1 day to as many as you need to help you achieve your aims. By now you will have an idea of what you would like to achive and where your dreams will take you. Don’t worry too much about definitions and descriptions. Mountaineering is simply about having fun, about getting out into the mountains and enjoying yourself – its just that the more you do it the more you will want to do and so the more you will push yourself. The reason we love the mountains is that there are no rules, no refereee or judge so get out there, enjoy them and do your thing!